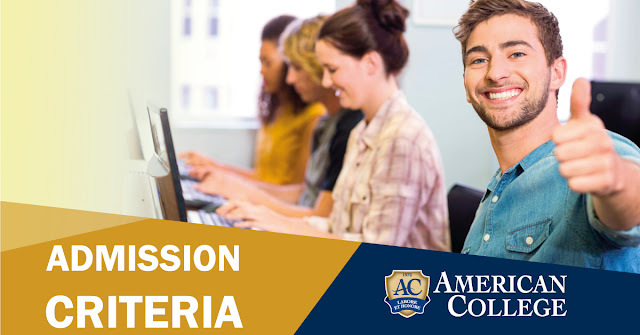 At American College candidates are considered for admission on the basis of their academic qualifications, regardless of race, color, religion, gender, handicap or national origin. American College students come from many parts of the world, bringing with them a diverse range of academic backgrounds, experiences, special interests, talents and cultural heritage. The Office of Admissions aims to form a student body which will give the opportunity to each student to share education and grow in experience as a member of an international community. A recognized Secondary (High) School Leaving Certificate (i.e. 12 or 11 years of education depending on the country of origin) or equivalent qualifications (e.g. GCE “A” levels). A recognized Secondary (High) School Leaving Certificate (i.e. 12 or 11 years of education depending on the country of origin) or equivalent qualifications (e.g. GCEs “A” level). A recognized bachelor degree or equivalent qualifications. The program is open to students with a bachelor degree in any discipline. Students without a business degree or students who completed their business degree over seven years ago and do not have managerial experience are required to take the MBA Foundation Courses to prepare for postgraduate studies in business. These courses are offered during the two weeks prior to the beginning of every semester/session at no additional charge. An average score of at least of 5.0 in the IELTS examination. A score of at least 40 in the TOEFL Internet Based Test (TOEFL iBT). A score of at least 38 in the Pearson Test of English Academic (PTE Academic). A Secondary (High) School Leaving Certificate where English was the language of instruction. A degree or a higher education qualification of at least 2 year’s duration where English was the language of instruction. In case a student does not possess one of the above English language qualifications but he/she is in possession of another qualification, he/she may ask the Office of Admissions if his/her qualification is considered as an equivalent to any of the above qualifications. If a student of a conventional program of study fails to provide acceptable proof of his/her English language proficiency he/she will be required to take the American College English Language Placement Test (EPT) during College registration. The EPT enables us to determine the student’s level of English language. Depending on the mark obtained in the EPT students will either join the regular courses of their chosen program of study or take English language preparatory courses. A Secondary (High) School Leaving Certificate or equivalent qualifications where Greek was the language of instruction. A certificate of very good knowledge of Greek language issued by the Cyprus Ministry of Education and Culture. A state certificate of attainment in Modern Greek level B2 issued by the Center for the Greek Language of Greece. A grade of “C” or higher in the GCSE O level / IGCSE Modern Greek examination. In case you do not possess one of the above qualifications but you are in possession of another qualification you may ask the Office of Admissions if your qualification is considered as an equivalent to any of the above qualifications.